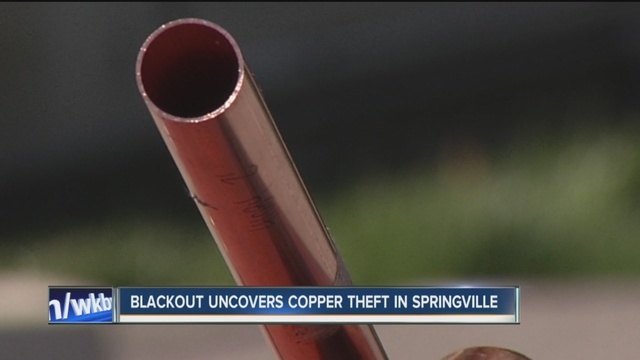 SPRINGVILLE, N.Y. (WKBW) – A copper theft was discovered Sunday while power crews investigated an outage in Springville. Crews were at the substation at North and Vaughn streets to fix the power outage, caused by “phase to phase” jumping, which tripped the main breaker. When they arrived, they discovered copper wiring had been taken, including one cable that carried 28,000-volts. The theft led to a delay in repairs being made and the area was without power for three to four hours. The company is looking to beef up security at the substation, including more lights, a better fence and gate, and more cameras. The Erie County Sheriff’s Office is investigating.